Research studies continue to find more and more health benefits from eating blueberries, including clearer thinking and improved stamina. 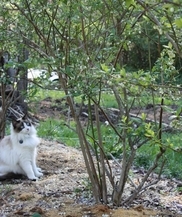 To offset any temporary nitrogen loss at the soil-sawdust interface, I put down a generous helping of turkey manure-based organic fertilizer before mulching blueberries. 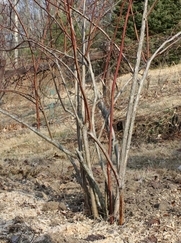 Our highbush blueberries produce beautiful crops year after year, and I’m convinced that the only secret is to mulch. 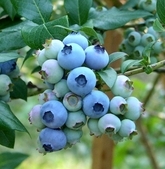 To grow blueberries successfully, attention must be paid to the shallow surface roots, which need to stay happily moist. 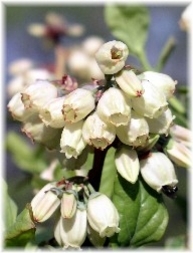 Penn State and Cornell agree that four inches of any organic material is a good blueberry mulch, but what’s the best? The correct answer depends on your site, soil, and available mulching materials, but after trying three blueberry mulches -- wheat straw over roll-out paper mulch (2007), bark mulch over newspapers (2008) and hay over newspapers (2009), we still weren’t getting the weed suppression we wanted. As luck would have it, a sawmill opened up down the road last year, and they have mountains of sawdust. For just over thirty bucks, a dump truck brought us a little mountain of our own. What wonderful stuff! It’s so light that we use a snow shovel to move it. 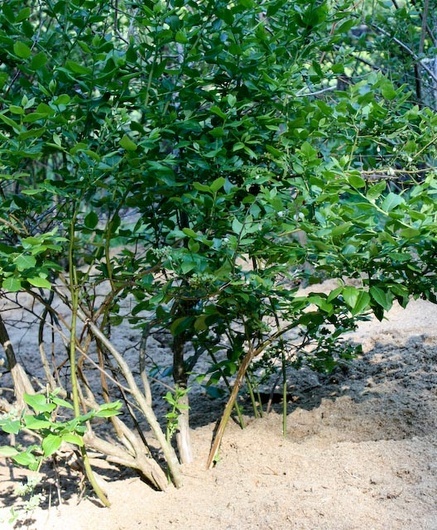 Sawdust mulch has a 60-year history of success with blueberries, and many experts think it is in a class by itself. 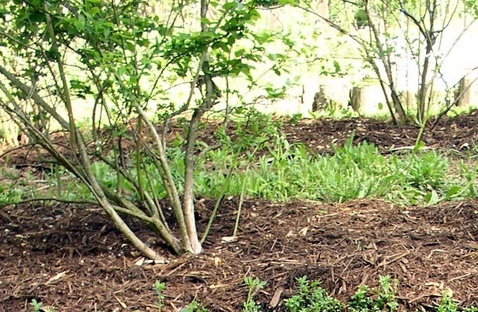 In Blueberry mulch - revisited, Virginia extension specialist Charlie O’Dell describes bringing an old, neglected blueberry planting back into production with sawdust mulch, piled 6 to 10 inches deep. But what really convinced me was Sawdust is My Slave by Rupert Stephens (1879-1976). In this cool old essay, Stephens tracks his use of sawdust mulch in his berry plantings in the 1940’s. I think the main reason my first experience with pine mulch went badly is that we did not use enough. Three inches of pine mulch should be considered minimum coverage for mulching blueberries. Five inches is even better. 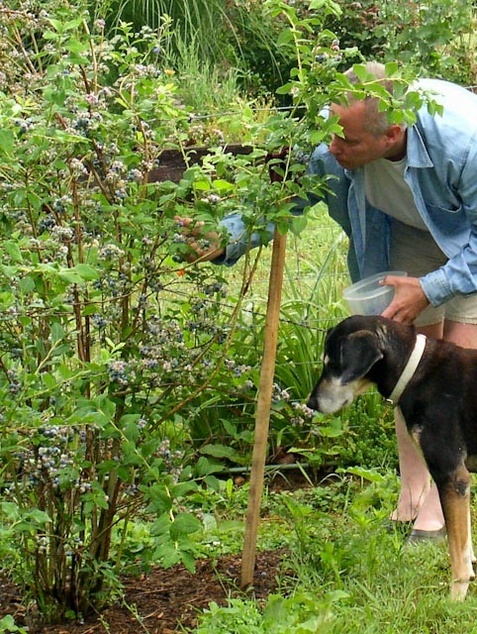 Blueberries are often the easiest fruits to grow organically in temperate climates. The National Sustainable Agriculture Information Service guide spells out the basics. Birds stealing your berries? Instead of bird netting, we use wedding net (tulle). Robins can't breach the barrier and hummers don't accidentally get stuck in it -- two problems with netting. Two years in sawdust mulch choked out all but a few weeds from our highbush blueberries. 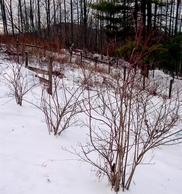 To grow blueberries well, pay attention to getting a good balance of new and old canes when pruning plants in late winter. For each new cane that appears, I remove an old one the following winter. Want to support my work? Buy my books! Coming in March 2017: Homegrown Pantry, my huge work on growing and preserving homegrown food for eating year round. It's a great book! Learn more about it on my Homegrown Pantry page.